But, the plants are coming to life, and I’m enjoying every little bit of color they are showcasing. We may get a little more rain this week, but then we are in for sun and 60’s so if I don’t get more of those weeds out they will be up to my knees. Today more plants are going to be potted up for the upcoming MG plant sale. We potted up over 400 last week. Now if we have good weather and lots of customers on the day of the sale, the proceeds will fund all our community gardening projects. If you are planting seeds this spring and have seen a product called inoculant, but weren’t quite sure what it was all about, I found an interesting post that explains how to use it. My seedlings are still doing well, and I’m hardening them off this week in anticipation of going into the ground. I’m also trying to propagate some lavender. I have a couple of plants but one is bigger and healthier so I took some cuttings this week, added some rooting hormone, potted them up and am hoping I will get a couple of additional plants. This Saturday I’ll work the ‘Ask A Master Gardener’ table at the Lee Church Congregational 25th annual plant sale. This sale has continually shown the rest of us how to operate a plant sale with its great organization and their tremendous customer base. But, this will be their final year as they have run out of willing people to volunteer. This will be a real loss for area gardeners. For Mother’s Day, I received this beautiful bloom on my Walking Iris. I thought it was all done for the year, but it gifted me one last time, and for that I’m grateful. If you need to rest up after several hours in the garden, are looking for a good drama to watch and like history, Steven Spielberg and Tom Hanks, check out Bridge of Spies. It is a good one. 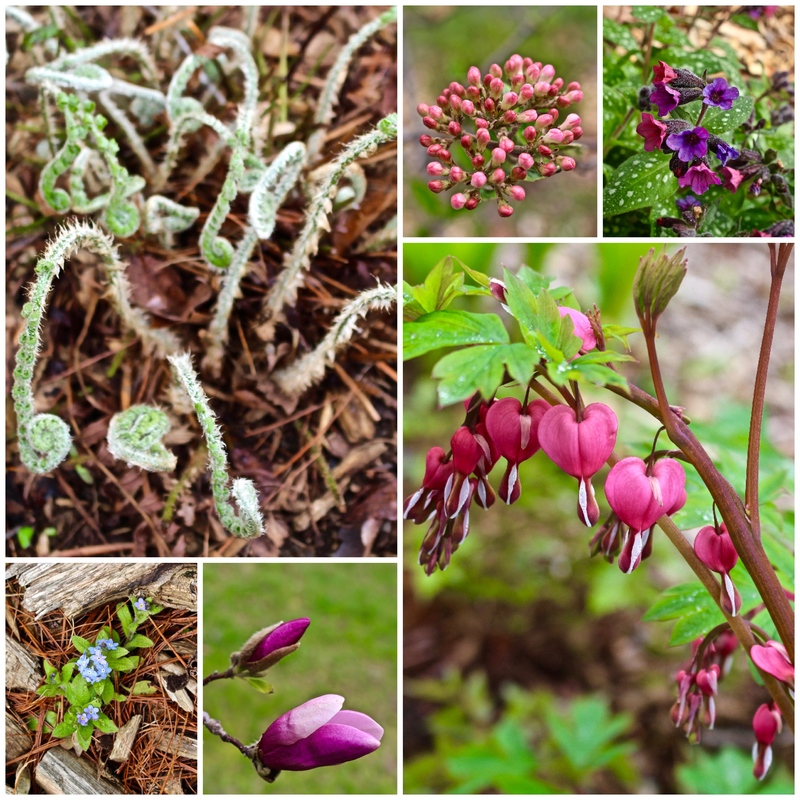 This entry was posted in Gardening and tagged Bleeding hearts, Bridge of Spies, Christmas Fern, Flower gardening, Forget Me Nots, Gardening, Inoculant, Master Gardener, Perennials, Plant Sale, Pulmonaria, Viburnum. Bookmark the permalink. Judy, what beautiful flowers! We could use a little of your rain down here. Ah, there’s your beautiful bleeding-heart. So lovely as are the other features. Ferns uncurling are wonderful. I also enjoyed Bridge of Spies. Happy weeding. The flowers are beautiful Judy! It takes a lot of work. By the way, if my family is any indication, the genes for weeding skip at least one or two generations. I can sense the excitement in your “voice” as the gardening season creeps slowly in to take possession of your soul and fill it with the beauty and satisfaction that comes when hard work is rewarded with a bounty of good things to eat and lovely things to look at! I hope you are successful with your lavender and are able to dry it and use it to scent your home through the long winter season. I love the scent! I’ve seen many good projects – at church, at school, and at non-profits – become impossible to stage for lack of volunteers. That’s unfortunate. While most of them won’t be able to match your Master contribution, there is still room at your sale for people who claim they are “lonely,” or “want to meet people,” or students who could add community service hours to their resumes. I’ve always been an advocate for volunteering and have made many lifelong friends while doing so myself! Wish I could stop by your table and ask you something intelligent! Distance and a decided lack of gardening knowledge prevent that! Judy, I can’t tell you how much your post brightened my morning, even with the bad news of the loss of the plant sale and the monstrous weeds. I’m getting ready to walk with a friend and her two dogs, but it’s once again gloomy and threatening rain. Sigh. Just hope it holds off until we’re done. Lots to do today, but no outdoor work, so if it rains later, I’m good. Oooh I love bleeding hearts. I had them in my old garden, so delicate, so sweet…I don’t know where to cram some in here, so I keep not. 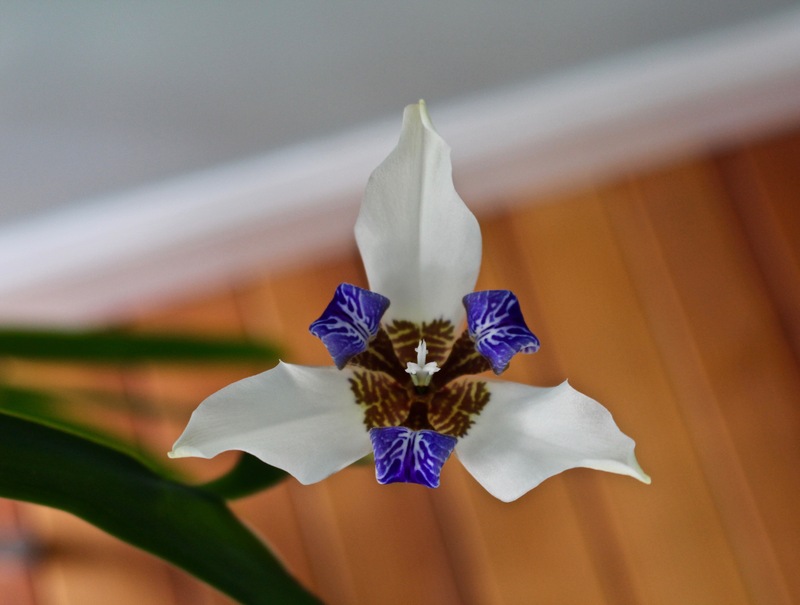 What kind of iris is that, the geometric white and blue? That’s a new one for me, I don’t know much about irises. It keeps raining here, too. Now that Mother’s Day has passed it’s usually time to harden and plant other things, but the weeks ahead seem too cold to plant…I’m a bit conflicted. Highs in the 60’s and 70’s but almost always with rain — do you think the ground is warm enough to help the seeds? I dunno. Weird winter has led to a weird spring. The iris is gorgeous. I’m not getting blooms yet since the jonquils and daffodils finished but it’s cool hear yet. I love bleeding hearts and planted five of them last year and hoping to see some growth and bloom this spring/summer. We’ve had the rain too and more showers this week but at least the wind is not blowing today. I’ve been meaning to buy some more epsom salt to put on all of my flowers. It worked wonders last year especially on my roses. I’ve also read that a serum using hydrogen peroxide is fantastic but I’ve filed the serum recipe and need to find it. Such pretty flowers. That Iris is gorgeous. I’m sorry there are not enough volunteers to continue the event, Judy. I can read it in your voice, the joy of spring!! Your photos are beautiful. I agree: the weeds have united and marched on the world this year! I cannot keep up. Best of luck with the plant sale! I know the art of weeding has not been passed down in this family either … And nothing like rain to bring them on! Enjoy the plants & flowers coming up.. It stopped raining. I can hardly believe it. I think I’m waiting for the umpire to call a replay and the rain to start again. I have seeds. With a little luck, tomorrow, I can PLANT. Finally! No one weeds around here, either, not even me. The garden beat me about 4 years ago and now, I let the weeds and the flowers duke it out. Oddly, they are all doing pretty well, weeds AND flowers. Your outdoor plants are so colorful and varied, Judy. I also enjoy the beauty in your recent Mother’s Day reward of one more flower from the walking orchid. It is exquisite! Really enjoyed reading about your gardening activities, Judy . . . and a thank you across the miles for supporting community gardening! It’s so nice to see your bleeding hearts since mine are finished now. Had to laugh about the weeding gene. I used to try and interest my own children in weeding, to no avail. But now that they have their own gardens and yards, they do the weeding that’s needed. I’m feeling the same pressure, to get out there and catch up with the weeds. It hasn’t been the rain here, so much, but the cold and wind that have kept me from doing as much as I should. But I see your photos and believe that, soon, we’ll have blossoms, too! “The art of weeding” — now there’s spin! Unfortunately, there are many who defer to the “artist.” As to rain, Indiana is awash and soggy. It’s been a dark spring, and the sunlessness does drain people. Gardeners and mothers of young children are going batty. You might sense a kindred note in my blog post today. I wish you weed victory today! When my grandchildren visit this summer, I’ll see whether the art of weeding was passed on the their generation. It skipped their parents. How sad that the plant sale is in its last year. Maybe the news of its impending demise will bring a new surge of volunteers. You never know. I’m thinking of lavender propagation too, so please let us know how yours goes. It’s exquisite weather here this morning and I can’t wait to get outside. It is sad because this group really had it down to a science and put on one of the best sales around. By all means, please let me know if your grandchildren inherited the weeding gene. 🙂 My granddaughter visited last evening and saw the lavender in the plastic bags on the window sill and asked me why I had plants inside bags. I think she thought I’d finally gone over the gardening edge. So, I explained I was trying to propagate four new plants from my best Lavender plant. I will for sure let you know if I was able to accomplish it. 🙂 Enjoy the sunshine. Beautiful blooms you have going here ….it looks to be showers and storms for the next several days here /grass and weeds growing like crazy. So lovely! I love those little curled up fellas in the upper left photo. Wow, your plant sale must be huge! The few around here are small by comparison. When I first moved here 26 years ago and was on a tight budget, spring plant sales were my lifesaver. Between those sales and gifts from fellow gardeners, I was able to plant my first gardens. It is a shame that they can’t get volunteers to continue the tradition at Lee. It is the same all over – nearly everyone works and doesn’t have time for volunteer work. It is hard on the few left. Yes, I think you have probably summed up the challenges. Master Gardeners are mostly Moms with older kids or retired folks so we can flush out enough volunteers. Great photos, especially the newly emerged ferns. Wish I could pot up my volunteers and take them somewhere to be sold for a good cause. So what is that picture in the upper left? I love this time of year when everything’s just coming to life. If what we planted only did as well as the weeds…keep up the good fight. Loved your photos. Lovely, fresh images of spring growth. The blue Pulmonaria (or lungwort) is especially vivid when you zoom in on it.